Jason “DJ Shine” Spanu, WaveDNA’s very own Application Specialist, was featured recently on the cover of AudioTechnology Magazine. 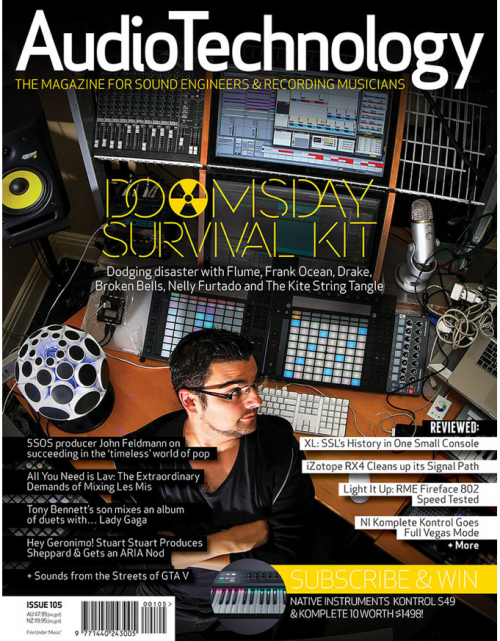 The article, Doomsday Survival Kit, discusses the growing issue of tech meltdowns during live performances. With artists, DJs, and producers increasingly using computers for their performances, there are a number of very real and terrifying things that can go wrong. AudioTechnology’s Mark Davie interviews Jason on how he mitigates risk and what he does when things go to hell in a handbasket. A career of touring the globe with acts like Frank Ocean, Nelly Furtado, Drake, and Broken Bells makes Jason the perfect person to give advice on how not to ruin a show for an audience of thousands. DJ Shine talks about staying cool, the ‘oh s**t!’ button, and the importance of redundancy. You can read the full article in Issue 105 of AudioTechnology Magazine. To watch our interview with DJ Shine, click here.